May be, it is normal to gossip when people gather around, be at a family function or a get-togethers and so on. But when gossips start circulating in an office, it not only harms the individual who is the target but eventually the organization as well. Many a times, gossips can just be a lie and meant to bring disrepute to the person. 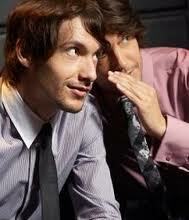 Gossips break trust and fill the workplace with doubts and apprehensions. In such an atmosphere, it is difficult to build a team and infuse team spirit. This will even lead to the organization suffer and its reputation and growth will be at risk. It is always good for the team and the organization to avoid a gossip mongering atmosphere so that a healthy team that relies on each other with mutual admiration, respect and trust can be built. Try to find out if there is any specific department where gossip is flourishing. Find out what gossips are being circulated, if there is any specific person who is targeted and why, and also get to the root cause of the problem. May be there is a discontent somewhere. Fix the cause before it turns malignant. The other way is not to let gossips arise at all. Gossips raise their head when there is not enough information about what is going on. If there is any major change happening in the organization, then let the employees know about it in advance, at least leave few hints. If it is found that gossips about some to-be introduced changes in offices are being circulated, then call a meeting of all employees and try to clarify. In brief, ensure that information is sent out at regular intervals so that there is no haze. A positive and joyful environment will spread enthusiasm and lessen discontent, thus creating a gossip-free environment. Assign work to groups so that there is healthy communication and cooperation. It is important for the leader of the organization to set up an ideal example by not encouraging gossips or taking steps to reduce such gossip and create a healthy environment for all to work in peace and harmony. At the same time, the employees too should set an example to those who spread gossip by remaining aloof from such an atmosphere and working sincerely. Gossips often arise when there is some dissatisfaction amongst employees. So ensure that there is a forum for employees to discuss and vent their discontent and discomfort. Let these forums be a solution provider to all issues. Let there be freedom to all employees to communicate effectively and fearlessly so that any issue that creates problem can be brought to the notice of the seniors and matters be resolved as and then and not wait for gossips to start about it and create further negativity. Many a times, problems arise within organization when favouritism comes to play. Sometimes, an employee is favoured over others or sometimes, the upper level executives are blithely unaware about the real working people and they continue to promote someone who works less but talks well. In either case, it is up to the leaders to find the truth and treat all employees on par. 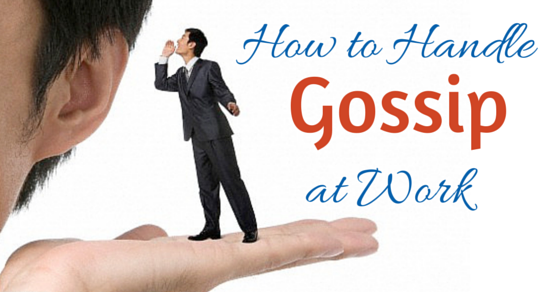 Sometimes, things that you tend as gossip can be a game changer for your company. For example, if an employee comes to you and speaks ill about another, instead of reprimanding the former, find the truth and then only take action. What if the information is true and that helps the company? If you are an employee of an organization and you get to know about a colleague who is spreading gossips and rumours about you, then rather than getting angry with him, meet him and have direct one-to-one conversation. Ask the person why he is doing so and what his intentions are. He will get the message. Instead of jumping into conclusions, find the subject of gossip. Deal with the issue, find what the problem is and the cause and tell the gossiper what you think about it. The best way to deal with gossips in office is to stay away from them. If a colleague has come to you and is badmouthing another colleague, who is not present there, just change the topic without even letting the other person know. If the person insists on telling the whole story and there is no escape then, verify what the person has to say by asking counter questions. If you feel the whole thing is a lie, just put that to the person very politely by saying, ‘That sounds too incredible to be true’, or ‘may be, we only know the half truth and we should give the guy some time’ and so on. If the officer managers come to know that there is a certain person who is spreading the rumours, then they should meet the person in private and discuss what is bothering him or her. There is no need to fire him or humiliate the person in front of the whole office but talk to the person, find the reason and the solution. If there are too many complaints and gossips about a certain person or a certain happening in office, delve on the issue and find a speedy solution to the same. Instead of spending too much time discussing the problem and dissecting about those responsible about it, it is better to find the solution. Be friendly with all your colleagues, do not assert your self-righteousness or try to be a saint. If you display an attitude and stay away from others and not be a team player, then it is but natural to have gossips about you, some true even. If there has been a while that some gossips are doing the rounds, then it is better to call all those involved and have a group discussion. Do not point at any person but just have a general conversation. Tell them that such malicious gossips are harming the environment of the office and that it will benefit all to stay away from such gossips and talk and focus on work. Spreading positive gossips is a better way to arrest negative gossips, point out many experts. Positive gossips are positive stories about a person, the growth of the organization and more. 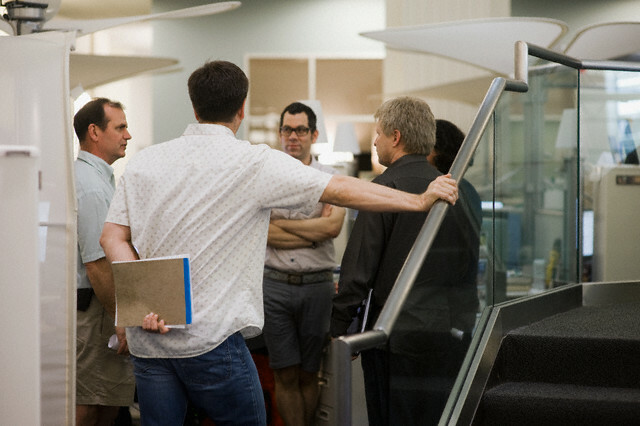 Happy employees mean a happy office environment and more trust and team spirit. Happy employees do not mean less work and more enjoyment. Employees are happy when their work is appreciated and they are given assignments according to their talent and expertises. Employees are happiest when there is a challenging working environment which makes them work better and harder. Create an open atmosphere where ideas and suggestions are encouraged, where people’s woes and problems are discussed and solutions are arrived at. Such an atmosphere builds trust not only of the employees with the management but amongst the employees as well. Tell the employees and other staff that it is a strict rule of the company that there will be no gossiping around and that strict action will be taken against those who do otherwise. At the same time, assure them that if they have any doubts or fears or anxieties, then they will be heard and a solution will be arrived at. It is up to the management to create empathy in the minds of employees for a certain colleague who has been gossiped about. It must be several reasons, the person’s personal life, his promotion, or any disciplinary action against the person. In any of the cases, the seniors should talk empathetically about the person and his situation to the employees. It is best to have friends who do not gossip and who concentrate on work in office. Some people won’t change themselves no matter what and it is best to avoid them. Be very careful about what you are saying at work and to whom. Office is not a place where you should divulge all information about yourself or even anyone else. Think before you speak. Even if you have heard about someone or a nasty occurrence in office, be responsible and do not share with any others, because that is what becomes a gossip. If you happen to come across gossips that might affect the reputation and overall morale of the office then do not hesitate to meet a superior. Tell him or her about it and they will find a solution. Spend your time in office constructively by focusing on your work and try to learn something new. When others see you that you are engrossed in work, they may not have the courage or time to disturb you and this is the best way to remain away from gossips. If there has been a discussion or meeting about any issue or problem, then the managers do have to ensure follow-up about the problem and find a solution as soon as possible. Gossips will never run out but attacking it at the root will ensure that they do not happen as frequently and that there is a healthy working atmosphere that benefits all, employees and employers.